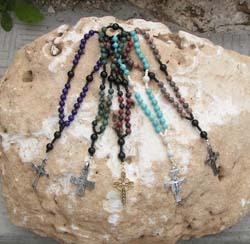 Anglican Prayer Beads are comprised of four groups of seven beads called Weeks which are divided by four Cruciform beads. The Weeks remind us of the days of Creation, the temporal week, the seasons of the Church year, and the seven Sacraments. The Cruciform beads point to the Cross as the central symbol of our salvation, as well as remind us of the four seasons of the temporal year, and the four points on a compass. A Cross followed by a single Invitatory bead leads one into the circle of prayer of the Beads, similar to the Invitatory (opening psalm) of the Daily Office. The symbolism of this particular prayer form is very rich and well grounded in Christian Incarnational theology. A flyer describing the symbolism is sent with each set of Beads ordered. 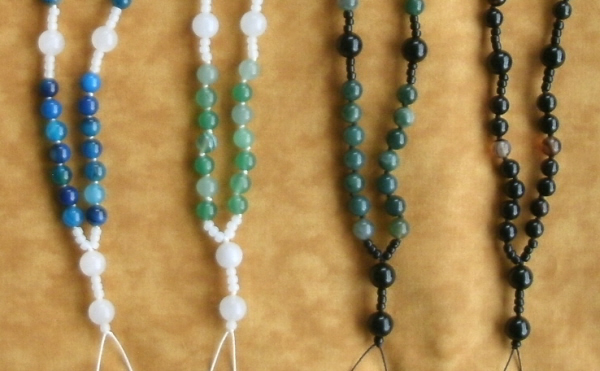 These Prayer Beads are prayerfully created by a member of the Solitaries of DeKoven both as a way to support ourselves and as a vehicle to intercessory prayer. 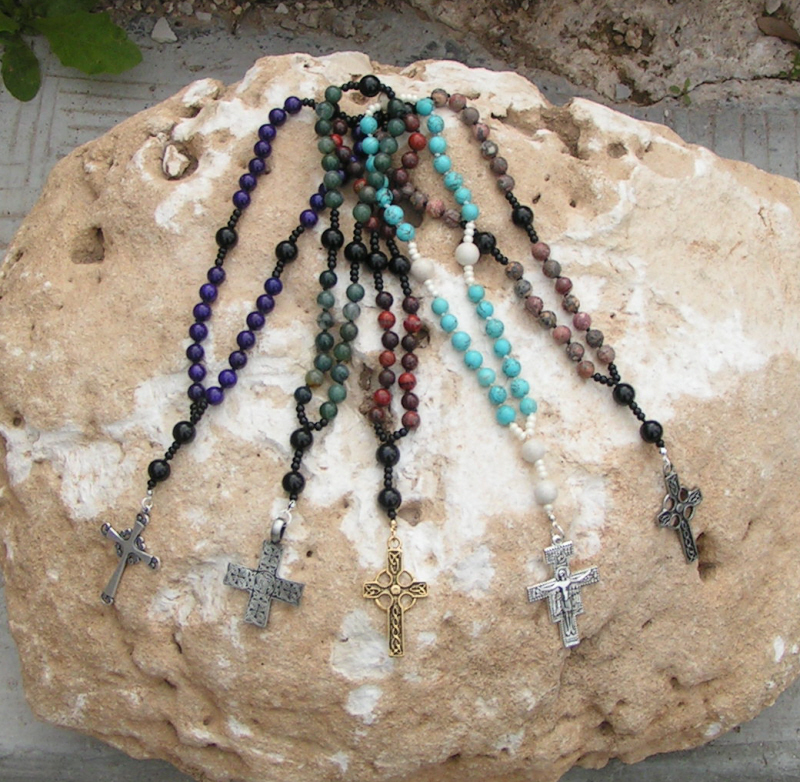 Our standard Anglican Prayer Beads are made from both dyed riverstone and a selection of semi-precious stones and five styles of crosses are available. If you are not familiar with our Anglican Prayer Beads, we explain how to use them. Blue striped agate: shades of light to medium blue paired with snow white quartz. Green agate-aventurine mix:�shades of green paired with snow white quartz. Dark green agate:� green hues ranging from mossy, olive, to forest green paired with black onyx Cruciforms. Black Agate:�various shades of translucent black, brown and tan paired with black onyx Cruciforms. Autumn jasper: all the colours of Fall paired with russet riverstone Cruciforms. Leopard skin jasper: marbleized earthtones paired with black stone Cruciforms. Poppy jasper: marbleized reddish earthtones paired with black onyx Cruciforms. Black quartz: Opaque black stone paired with black stone Cruciforms. Snow (white) quartz: Translucent white stone paired with snow quartz Cruciforms. Rose quartz: Translucent soft pastel pink paired snow quartz Cruciforms. Blue, Green, Red Quartz: dyed translucent quartz paired with Chinese porcelain (colour and design of porcelain will vary). Dyed Riverstone Riverstone paired with black onyx Cruciforms. Occasionally dyed opaque quartz may be substituted. Colours offered are: dark blue, green, red, and dark violet. Lapis Lazuli medium to dark blue paired with black onyx Cruciforms. Turquoise magnesite paired with natural riverstone Cruciforms. From time to time we retire certain bead colours or purchase a small amount of beads on sale for a special order. We are able to offer what we have on-hand to our customers at bargain prices. You tell us whether you want dark or light beads and we will choose a colour for you. Due to the cost, the goldtone cross is not available with clearance specials. The picture below is a representative of some of the different stones you might receive. If you order more than one, we will send different colours. 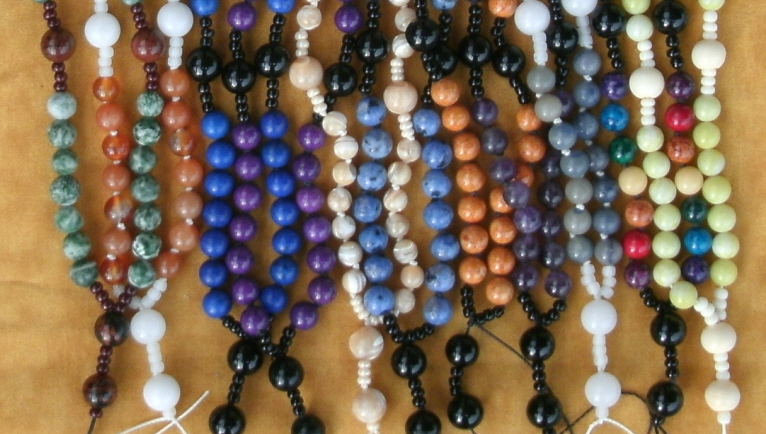 Click to Order Your Prayer Beads On-Line by credit card, money order or check. You will be given a choice of payment options before check-out. Contact us by e-mail or at the address below about wholesale pricing for bulk orders.